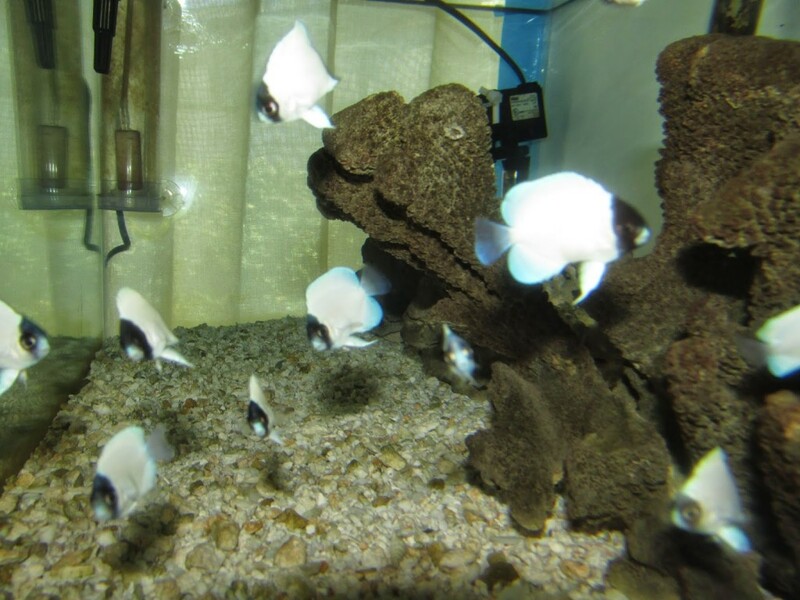 Karen Brittain Breeds Genicanthus personatus, the Masked Angelfish, Again! 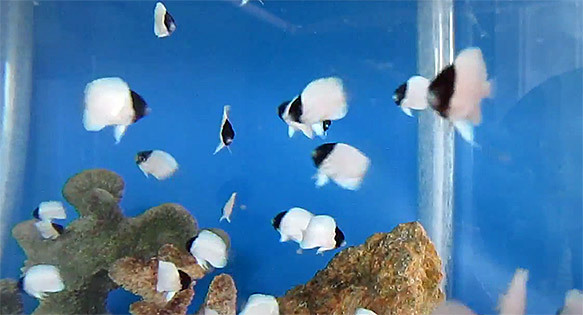 Video screenshot illustrates swarms of captive-bred Genicanthus personatus, the Masked Angelfish, a feat accomplished by breeder Karen Brittain! 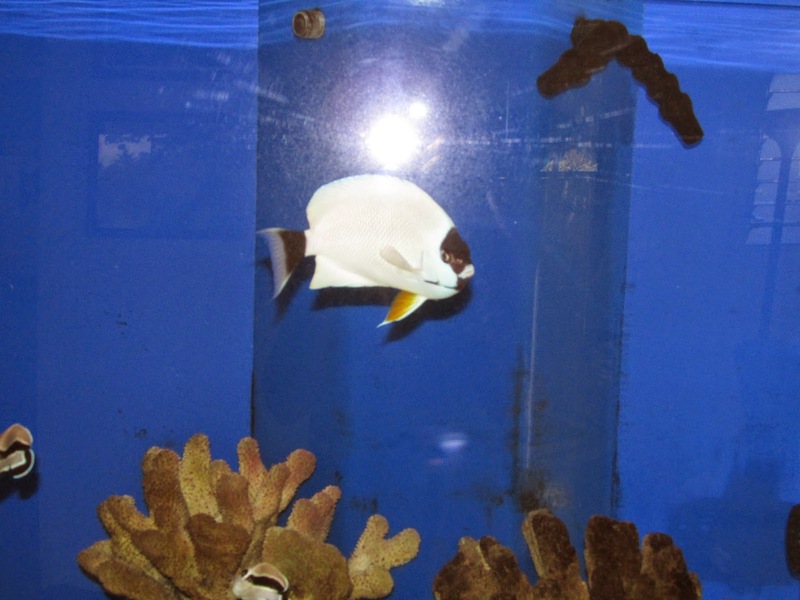 Over ten years ago while I was working at the Waikiki Aquarium I had the amazing opportunity to spend some time over a couple of years to do larval rearing work with the Masked Angelfish, Genicanthus paersonatus. We succeeded in raising one fish “Geni Babe”. Since then one of my life goals has been to work with G. personatus again. It was a goal that I believed might not ever happen but I kept it swimming around in my head as a dream. This last spring that dream came true with an unbelievable opportunity given to me by rebreather diver Rufus Kimura. The information was to be kept under wraps until it could be announced at MACNA in Colorado this weekend. So now I am free to share the information with you. The following video footage and photos were taken by me and if you’ve visited this site before you know that I am not a good photographer. A friend of mine, Leighton Lum has taken some lovely photos of the adults and juveniles as well as other fish from the Faith and Fabio Project. You can visit his site at Photography by Leighton. Rufus went down, deep. 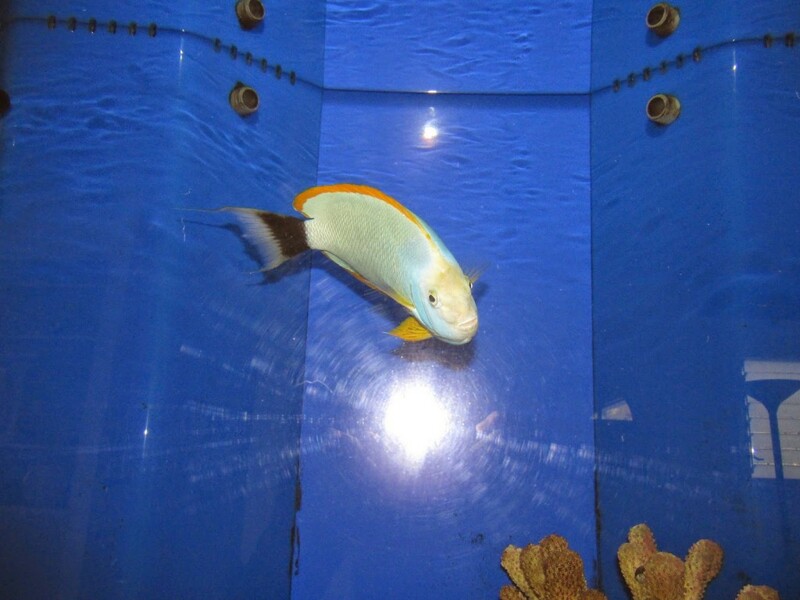 He collected a pair of masked angelfish. The male was the largest I’ve ever seen and became known as Jumbo. The female is lovely and is known as Hina. Here is a photo of each. The photos do not do them justice! The pair was collected in the winter and spawned on March 2. I was busy with the Paracentropyge venusta of the Rising Tide Conservation project and had to fit the G. personatus into my free time. The following two months were the most hectic, exciting, stressful and fun months as I made the journey through the most successful larval rearing run I’ve had to date. Here are a couple of photos of the juveniles taken yesterday at six months of age. The following are video links to You Tube so that you can see how the larvae progressed starting with the most recent. Here is day 57. G. personatus juveniles casually swimming around their grow out tank. Day 49 playing peek a boo. 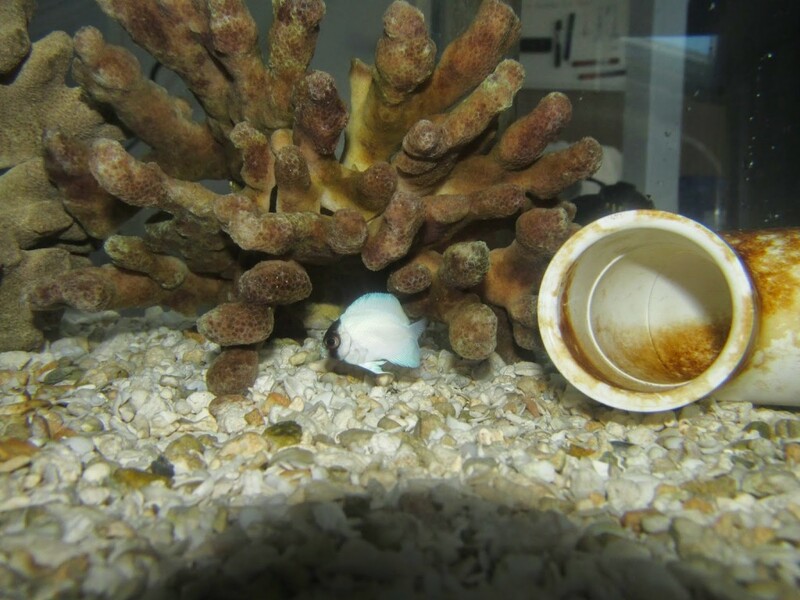 Here we are at day 40 when the first laval personatus settled out to it’s juvenile form. Day 36 when I transferred some of the larvae to a bare tank which had my “magic rock” in it. 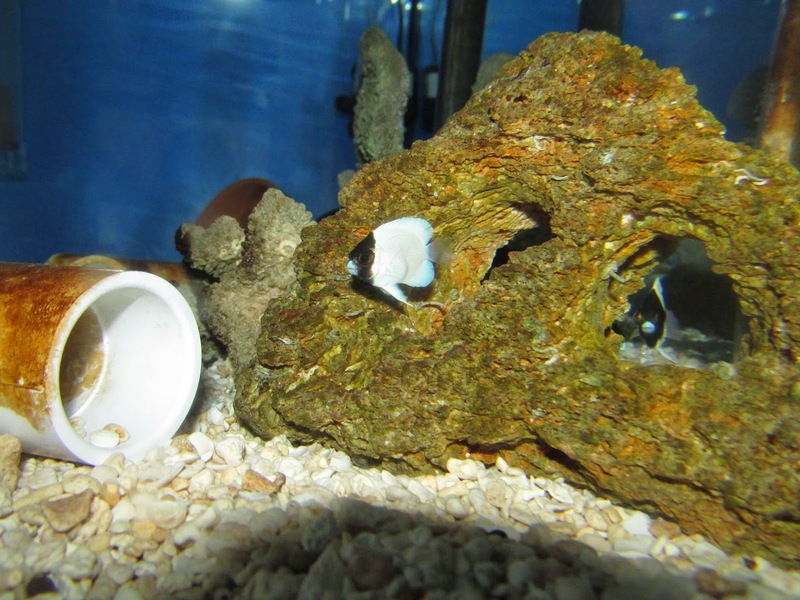 This is the rock most of my clownfish have started spawning on and the rock that Geni Babe settle on over ten years ago. Day 30 of the larval rearing run. This larval run was done using wild collected plankton and I think it’s interesting to note that this was my best ever larval run and has been a year of amazing reef fish recruitment in Hawaii. Rufus requested a video giving my perspective on this “G. personatus Project”. I would like to leave you with the video and a message that I wrote to a friend regarding the video. I think that video may come back to haunt me. I’m not good at being in front of the camera and I’d never done a video with the computer. My husband set me up with photo booth on the lap top and went to bed. I tried four times and on the fifth I thought, that one wasn’t as bad. I must have thought that out loud because my husband says from the bed “I heard you say UM at least ten times”. So I tried several more times and finally felt OK with it. The sound wasn’t very good but I had the volume all the way up so I stuck with it and sent it to Rufus. Oh the sacrifices I make for this hobby!